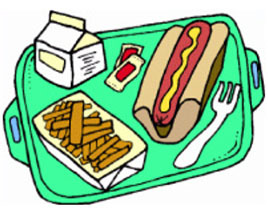 Hot school lunches are available from Monday to Thursday every week but only packed lunch is available on Fridays (only for P1-3). These lunches are cooked offsite and delivered to us. The cost of each meal is £1.95. Payment should be given to class teachers (via your child) every 3 weeks on a Thursday morning in a sealed envelope with the child’s name on it, along with the completed menu slip. You can choose which days your child is going to have school lunch and which days you’d prefer them to have a packed lunch from home. Since January 2015 all Primary 1, Primary 2 and Primary 3 children are entitled to a free school meal. Milk can also be purchased termly or yearly. Letters asking for milk money are issued at the start of each term. We encourage children to drink water during the day and we ask you to provide them with a proper water bottle. Meat products used are not Halal. School kitchens are not equipped to provide gluten free meals. Menus change very slightly depending on whether it is a winter or summer term. The menu has been prepared in line with the Scottish Executive’s Hungry for Success campaign.Here is the current school menu offered at St Margaret’s Primary.